“Our ability to grasp, to build, and to make our thoughts real lies inside this complex of bones, nerves, and vessels”…“The hand is a signature for who we are and what we can attain.” Neil Shubin, Your Inner Fish: A Journey into the 3.5 Billion Year History of the Human Body. In the past year my hands have taken on a life of their own. During yogic and meditative states, an external/internal energy begins to pour into my palms, compelling my hands to form basic shapes and gestures. Sometimes it feels like my hands and fingers are being pulled by a force, other times it feels as if they are seeking to express something, embody something – but what? So in a quest to better understand what was happening- I began to research everything I could find about the hand. And what I discovered was revelatory. According to Gertud Hirschi, author of Mudras: Yoga in Your Hands, the idea of the hand as containing and expressing divine energy is found in nearly all spiritual traditions. Hand gestures are depicted in cave art, indigenous art, Christian and eastern religious iconography. The traditions of Tantra and Hatha Yoga, Buddhism and Taoism, agree that the palms of the hand contain energy vortices (chakras or power-points) that connect the physical body (brain, organs, glands, veins, tendons) with the subtle or energetic body (chakras, nadis, meridians). The thumb and each of the fingers are imbued with specific metaphysical powers, and offer channels for the flow of Prana or Qi (life force or divine energy) through the energy body. While mudras can happen without conscious volition, they can also be used deliberately. By utilizing certain hand postures and pressing the fingers together in particular positions, prana can be channeled intentionally along differing energy pathways (nadis or meridians). Of course, the existence of these “spiritual energies “and “energetic bodies” is still up for debate. In the modern scientific paradigm, using hand gesticulations to engage with our chakras and meridians is pointless – there is no hard evidence documenting they actually exist. But what I do find compelling is that science is coming up with evidence that mudras DO create real physiological effects in the body and brain. Today we know that every area of hand forms a reflex zone for an associated part of the brain. And the hands, with their multitudes of nerve endings, occupy a significant portion of this neural tissue. Neural imaging experiments on mudras have demonstrated not only their ability to activate specific portions of the brain, but alter brainwaves and create specific physiological states. Davis and Walter also found the natural energy in the palms was similar to the two different energies that exist in all magnets. By clasping the hands together in prayer or Anjali mudra as it is known in yoga, forms a “closed loop” or a “closed circuit.” Energy flows through this circuit from right hand palm (positive) to left hand palm (negative) enhancing the flow of electrical energy within the body”. Interestingly, this is similar to the Taoist view of the left hand as conducting yin energy and the right hand, yang energy. s that we direct Qi towards the fulfillment of our will and intention. Okay so this idea that we can manifest our desires through the power of our hands may seem just a little woo-woo. But bio-imaging studies demonstrate that the hand, palm and fingers emit an bio-magnetic energy that has measurable effects on the physical world. Experiments by John Zimmermann with highly sensitive SQUID (Superconducting Quantum Interference Device) detectors measured increased magnetic field emission from the hands of psychic healers hundreds of times stronger than normal body activity. Is this pseudo-science as the skeptical minded contend? Or are we slowly beginning to rediscover what the Tantric and Taoist mystics already understood, the energetic power of the hand to shape reality itself? On this question, I find the hand’s evolutionary history most telling.Research published in the National Academy of Sciences revealed that hand gestures stimulate the same regions in the brain as language. 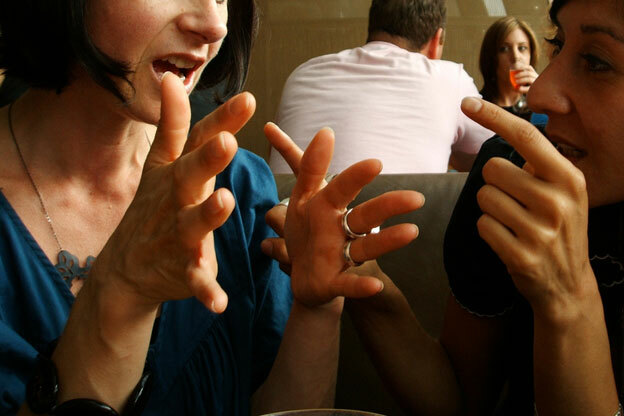 Research in the field of language evolution suggests that this is because gesture is hardwired into our physiology and may well be the oldest form of communication. That’s why we all understand that hands held high in the air means victory or that two pairs of hands clasped together means love. Studies conducted in the emerging field of ’embodied cognition” demonstrate how the simplest of hand gestures affect our psychology i.e. reaching upward makes it easier to recall happy memories, while reaching downward brings negative memories to mind. Researchers theorize this phenomenon may have something to do with dominant and submissive body postures, which are deeply wired into our most primeval instincts and internal structures – and take place at a realm beyond conscious awareness. David McNeill, has spent the greater part of his career studying body language and gestures and he believes our hands are doing much more than simply expressing our inner states. McNeill concludes that gestures do not simply form a part of what is said and meant – but have an impact on thought itself. He writes “When we speak, we shape our thoughts for language, and when we gesture, we shape them in the space in front of us…by putting our thoughts in our we learn and remember better, speak more fluently and find the right words.” McNeill theorizes that gestures directly transfer mental images to visible forms, conveying ideas that language cannot always express. So is it by talking with our hands, that we discover what we want to say? By helping us verbalize, give name to what was previously unconscious (inchoate emotion or sensation) are our hands helping to shape self-consciousness itself? 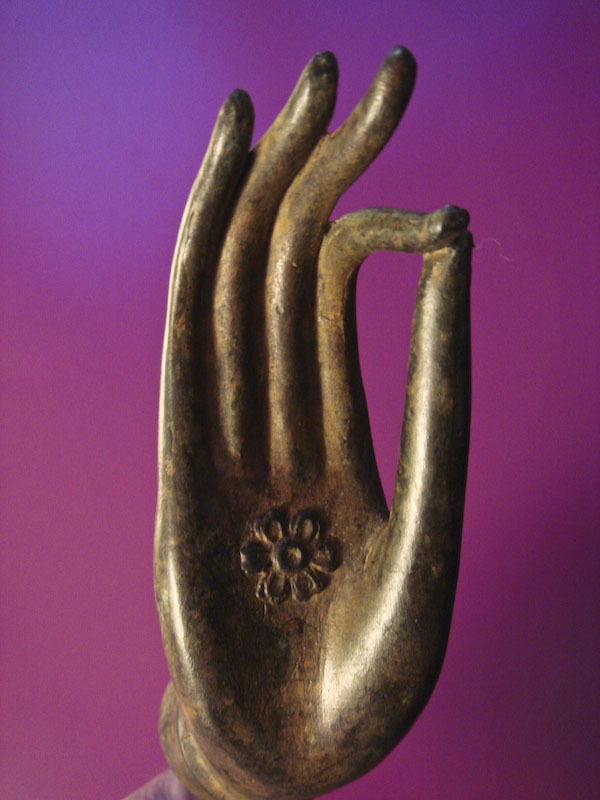 And so I wonder (when my hands are spontaneously forming mudras) – what knowledge are they attempting to express? In the end, what resonates most in my exploration of the hand, is its connection to the greatest and mysterious energy of all, love. Because, all the traditions of yoga agree, the hand chakra connects directly to the greater chakra of the heart. Which seems so obvious, after all? Because it is through the physical expression of touching, stroking, holding, that we give and receive love. Neuro-imaging also shows us the area of the brain called Broca’s area (where language is believed to originate) lights up when people grasp an object and when they watched someone else grasp the object. This is theorized to be the work of ‘mirror neurons’ – meaning when we watch each other gestures – we literally “feel” them in our body. So could witnessing a mudra be as powerful as experiencing it? I find this question intriguing considering that Anjali mudra (hands clasped over the heart) has today become practically synonymous with all things “spiritual”. According to the great yogi sage Krishnamacharya, this gesture “seals” our relationship with the Divine, and “signifies the potential for an intention to progress to the greatest spiritual awakening”. Could this image, gracing nearly every new age, meditation and yoga website/magazine/product, actually be capable of affecting us spiritually? Did ancient mystics already understand this? Is this why images of sacred hand postures are so ubiquitous in spiritual art? Who knows? But it’s an interesting question to contemplate. So it makes sense then, that our hands are the “flow-ers” of the cosmic energy of the heart. And that’s why while I’m still not exactly sure what my hands are doing or why, I’ve decided to go with the flow and trust them to lead the way. Because whether it’s through “spontaneous mudras” or reaching out with a caress, I trust that my hands are transmuting divine energy -love- into the world of form. I am a CranioSacral Therapist, and this is so true. A great writing about the power of hands! Thank you for it! Namaste! It astonishes me, and yet somehow I’m not surprised at all, when these ancient concepts arise for examination across the planet simultaneously! In my yoga classes at the local university, we’ve been discussing Michelangelo’s image (Creation of Adam) and using those hands as models for giving and receiving the divine spark of life… Relaxed yet attentive, soft, yet muscular, yin and yang. Thank you so much for the additional information you provide here! Great article. Just posted for my friends and students to see on Facebook. Thank you, Danielle, for the macrobibliographic breadth of your research and microcosmic personal insight of your hands. This has been the major focus of my life for the last 15 years as a licensed health care provider, i.e., studying and developing my hands as a tool for manual therapy. Much of my training has been with Frank Lowen , who for years, was a lead Cranial Instructor with the Upledger institute which has a worldwide reputation for continuing education for manual therapists. Frank’s early potential was recognized by Jean-Pierre Barral (developer of Visceral Manipulation) who hand picked him to be his personal protégé and later the Director of the entire program in the States. Through the years as Director of the program, Frank continued to develop his own unique method of using his hands that was clearly outside the scope of what Barral taught even while remaining true to the teaching of his mentor. As chance would have it, Barral was involved in a bicycle accident and asked Frank to use his hands to alleviate some of the more intractable discomfort that persisted from that mishap. The following day Barral told Frank that he had been up all night thinking about how Frank had used his hands to alleviate his discomfort and commented that Frank’s work was unique, original, highly effective and that Barral did not want to know any more about it because he wanted to be uninfluenced to develop his own work. Eventually Barral gave his protégé permission and his full blessing to leave the Directorship whereupon Frank began to develop and teach just own unique work. The unique component of Frank Lowen’s work is how he uses and teaches his students to use their hands. What he has discovered is completely unlike anything anyone else has discovered, even in the breadth of literature and studies which Danielle sites in her post as well as the teachings of any manual therapist to date. I would invite anyone interested in developing their hands to visit the website at http://lowensystems.com/ . You do not have to be a licensed therapist to take the Core Concepts class which will be offered in Seattle February 21-23, 2014. Anyone, licensed or not, with an interest in this unique use of their hands is welcome. I have personally observed several students who had no prior formal training whatsoever in this field (other than curiosity) participate and depart confirming what had been taught. Continuing education credit is available for those already licensed. We must hold in our hand. Oops! My apologies for not following your custom of at least referring to the book in print about this therapy: The Roots and Philosophy of Dynamic Manual Interface by Frank Lowen, North Atlantic Books, 2011. Caveat however: Merely reading the book leaves a super incomplete understanding of the skills needed to acquire some beginning competency and is no substitute for the practical training provided in the beginning Core Concepts Class. I am assisting at coordinating this class referred to above in February 2014 and am also available to travel up to BC and give a short introduction to those interested with no obligation to sign up for the Seattle class.